When it comes to caring for an aging loved one, it can be difficult to find ways to stimulate positive interactions, unlock memories, and manage stress-induced agitation, especially if the individual has Alzheimer's disease or dementia. At Visiting Angels - Winter Park, the staff provides dementia care so your loved ones can remain comfortable in their own homes. One innovative way Visiting Angels caregivers are now providing excellent dementia care is by incorporating music into memory treatment. Music has been shown to shift mood, manage agitation, stimulate positive interactions, facilitate cognitive function, and coordinate motor movements. Even people with late-stage dementia can engage in music. 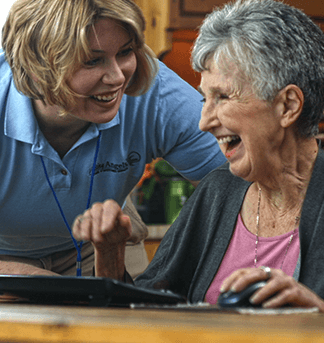 No matter what senior home care service is being provided, whether its companion care or personal care, dementia care or end-of-life care, the Visiting Angels caregivers can incorporate music into the in-home care services. For example, playing music from someone’s young adult years has the potential to have strong responses and the most potential for engagement. Singing music from a loved one’s childhood often sparks involvement. Also, music has been shown to assist with activities of daily living, so a Visiting Angels caregivers might play music with percussive sounds and quick tempos to facilitate movement from one room to another. Music can also help individuals with dementia diffuse agitation or frustration by redirecting their attention to dancing or singing or tapping their feet to the beat. Whether it’s listening to a song that someone enjoyed in the past, singing along to old-time favorites, or playing soothing music to provide a sense of comfort, the Visiting Angels caregivers incorporate music into dementia care so seniors can have a good quality of life and families can have peace of mind. For more information about the senior home care services offered by Visiting Angels - Winter Park, visit the website or call (407) 236-9997.